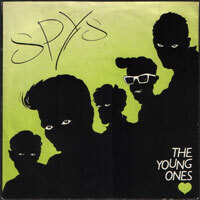 The only good cover version I’ve heard of The Young Ones was done by The Secret. Why did the Spys embarasse themself to release such a shamefull version when the flip Heavy Scene is one mastodont powerpop hit? From the opening with the fliping coin till this song ends on 3:20(ouch!) this give me constant goose bumps. The Spys released a second 7inch called Daddy Was A Dj that I haven’t heard. But if it’s up there with Heavy Scene then give me a hint. “Daddy Was A DJ” was a different band – this was the only release by these Spys. Most people who have an opinion on this will probably tell you that The Spys were actually XTC, but no: it was The Young Ones, who did “Rock’n’Roll Radio”. Thanks for the info Steve. If someone told me this was XTC in disguise I wouldn’t believe them even though they’re produced by John Leckie. Hard to do a remake on Partridge or Mouldings very characteristic voices. ohh come on now, I thought Menace did a killer version of the Young Ones….